Kartik and Kenith will headline the Hughes Academy’s June Live Pro Wrestling event in a Tables Match. The Neo Viper issued the challenge to Kenith at Live Pro Wrestling on May 2, after Kenith cost Kartik his shot at the Hughes Academy Championship by pushing him from the top rope and through a table set up at ringside. Kenith didn’t respond to Kartik’s challenge at the time, but the match has now been made official and will be the main event at the Kelston Community Centre. June’s Live Pro Wrestling will also feature the return of the annual Hughes Academy tournament, now in its third year. “The Shooter” Shane Sinclair won the first Hughes Academy tournament in 2013, beating Inferno in the tournament final to take the Hughes Academy Trophy back to Wellington. Marcus Kool swept through the 2014 tournament, beating Charlie Roberts in the tournament final and going on to defeat Sinclair. This year’s tournament will have eight competitors, with the winner claiming the Hughes Academy Trophy. The live audience will be responsible for picking the first round matches. 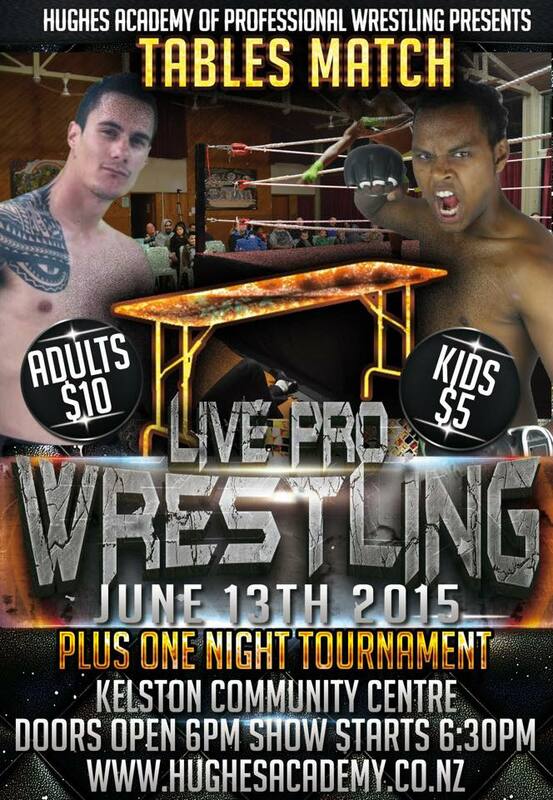 Hughes Academy Live Pro Wrestling takes place June 13 at the Kelston Community Centre in Auckland.